When my daughters were little, they often bruised or scraped themselves in the course of everyday play. A kiss from Mommy or Daddy (and perhaps a Sharpie-drawn smiley face on a Band-Aid — whether necessary or not) was all it took to make things okay again. Sometimes other tots grabbed toys, knocked over blocks, or cut their Barbies’ hair — oh, wait … it was my child who did that (as practice before “trimming” her friend’s bangs). All it took to reset their emotional footing was distraction — manufactured by word or sleight-of-hand. Almost at once, they got back to the business of learning by play. As they grew older their minds and hearts grew into increasingly complex, interdependent organs. It became harder to “fix” what upset them. The inevitable day came. A daughter spurned my offer to “kiss it better” as she clutched at the reddened skin on her forearm. “That won’t help,” she pouted, her eyes daring me to contradict her. My offer to read her a story elicited the same response. She was right, of course. A hug or kiss didn’t take away the sting of the injury. 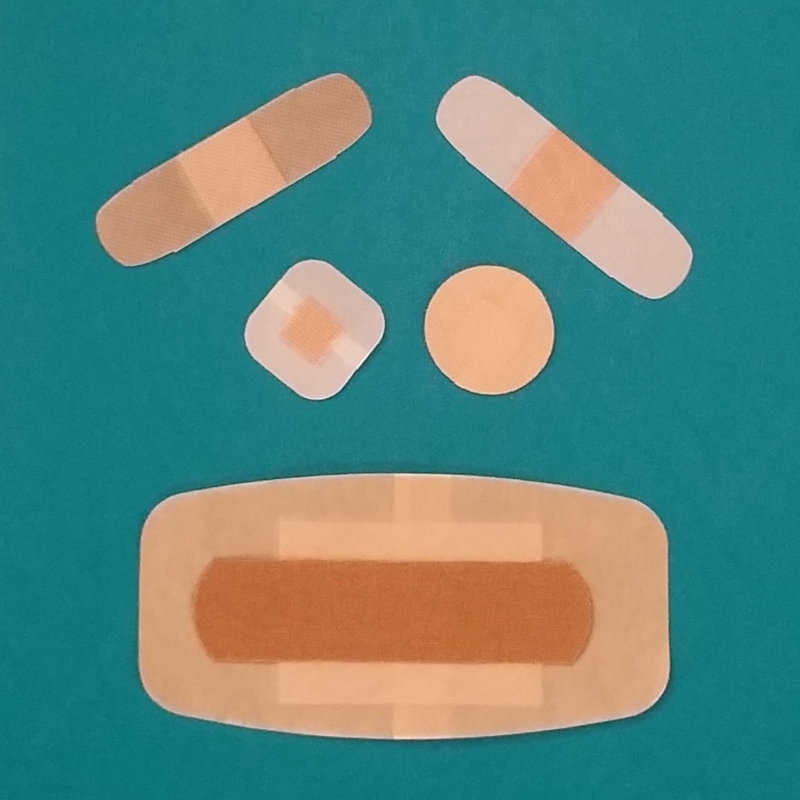 A bandage could cover the wound (at least temporarily) and hopefully keep out germs that would otherwise impede healing, but beneath its plain (or decorated) facade, remained a wound that required time — and the right circumstances — to mend. A kiss of affection, a favorite toy to hold, or a new story to distract might momentarily provide another focal point, but every heartbeat fueled throbbing reminders that all was not well. It’s the same for grief. Bandages don’t work. You can’t put a bandage on grief to “fix it” or “make it better.” Like any wound, it takes time. Significant dates — birthdays, holidays, anniversaries (of both positive and negative events). For many within the first 18 months after a loved one’s death, that day of the week (every week) and that date of the month (every month) feels like ripping off a fresh scab, re-traumatizing survivors. The “business” of death — deeds, accounts, titles, plots, medical bills, insurance … The list of accounts can seem endless for an adult or unfairly incomplete for a child. Making each phone call or office visit is excruciating. Every time I called another provider, I sobbed. Removing my husband’s name from each document felt like erasing him. It felt disloyal. It felt violent. Horrible. Routine “first since” appointments — the dentist, the doctor, the pharmacist, the mechanic, the accountant … Anywhere a person has done business in an ongoing manner, that first visit since the death occurred forces yet another face-to-face bout of admitting a loved one is no longer living. As a new widow, I cried every time. Many forms had boxes to check that offered only the options of single, married, or divorced. I wrote in “widowed” on paper forms. Online forms frustrated me so badly I shrieked at the computer (and I’ve never been a “yeller”). If I checked “married,” they required ongoing contact information no longer applicable, but for a long, long time I refused to consider myself “single,” so that option didn’t work, either. Getting groceries — ugh! Walking through the aisles was awful, awful, awful. “His” foods stood out on the shelves. I couldn’t find things I wanted right in front of me (on rare occasions when I actually knew what I wanted). I couldn’t even remember to consult the list in my hand. The first time I saw THE paramedics from the nearby fire station in the store, oh, how I lost it! Be with them in their grief. Be patient as they heal. *For an in-depth look at one element of grocery-intensified grief, see my essay “Eggplant Elegy” in the online journal Segullah.